Unique Gifts: You Got Me a What?! There is no box or gift bag in the world that could cover the dramatic lumps and bumps of a dromedary camel long enough to surprise anyone. So let Heifer handle the details and be a part of helping a struggling family overseas. To order a camel or a share of one in honor of a family member or friend, follow this link. No. 1 reason: Camels supply nutritious milk rich in vitamin C to families in drought-prone areas where other livestock can't survive. The milk provides food and income to help with other necessities. No. 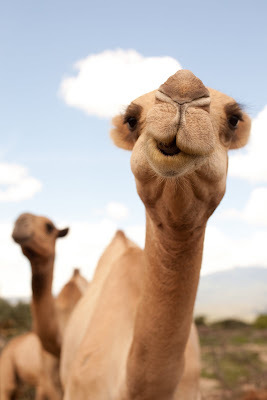 2: A camel is a quirky gift of optimism and joy and reflects a wish to play a small part in a better world. Deep in deserts, camels serve as almost the only source of transportation, food, clothing and shelter. They can carry loads of up to 330 pounds for eight hours. They can run 10 miles per hour and travel as far as 100 miles in one day. A camel can hear well but like a donkey it often pays no attention to commands unless there's something in it for him. Long, curly eyelashes protect their eyes from blowing sand. Thick eyebrows shield them from the sun. The hump of a camel is mostly fat. If food becomes scarce, the animal can use fat in the hump to provide energy. It isn't a storage place for water as many people believe. Camels are sometimes called the "ship of the desert" for their medium-speed pacing. Both legs on the same side lift together and come down together, providing the swaying motion. To read World Ark's article how Heifer camels continue to help a Maasai community in Tanzania, go here.